From our weapon pits, in the sand dunes at the foot of the Long Hai Hills, Anti-Tank Platoon had ringside seats for one of the most awesome sights modern warfare can provide. Right before our eyes, American B52 bombers were obliterating an entire mountain range from our view. The mountains were there in front of us, but all we could see was smoke. The explosions started before the aircraft were even visible. The fiery blasts came first, followed by the shock waves. We were so close that we could actually watch the shock waves passing over our heads. In a very short time there was nothing but smoke. I remember thinking at the time that an innocent young Aussie bloke could never be the same again after seeing something like that. Little did I know how many more times I would have that same thought in the next six weeks. Welcome to Operation Pinnaroo! 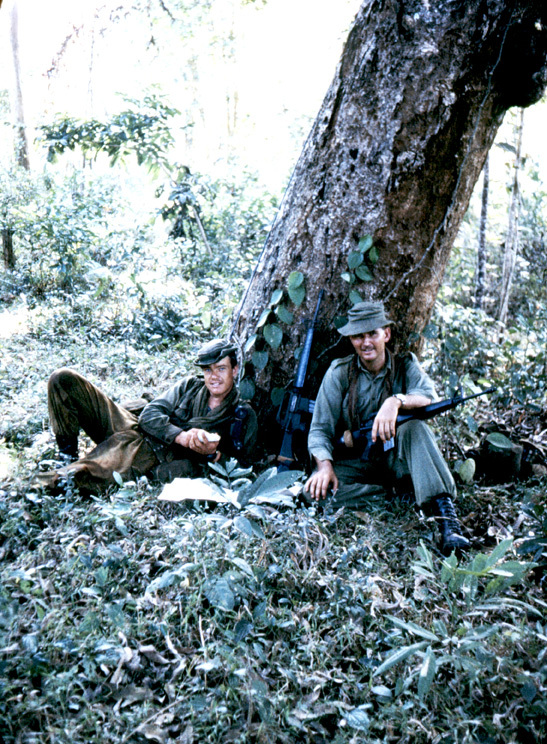 3RAR returned to Nui Dat following the battle at FSB Andersen on the 1st of March 1968. 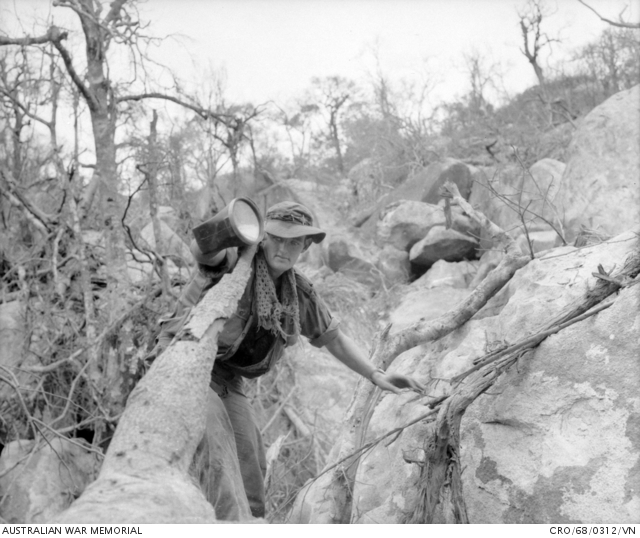 One week later, on the 8th, we set out for the Long Hai Hills, south of Nui Dat, on Operation Pinnaroo. This operation was conducted by 3RAR and supporting units in the Long Hai Hills, in Phuoc Tuy Province, in March and April 1968. The operation involved searching among minefields and tunnels. The battalion suffered heavy casualties, as did the other units who supported us. By this time, the building work in the Anti-Tank Platoon lines at Nui Dat had been completed. I shared what would normally be a 4 man tent with the Anti-Tank storeman, Willie Gutjahr. 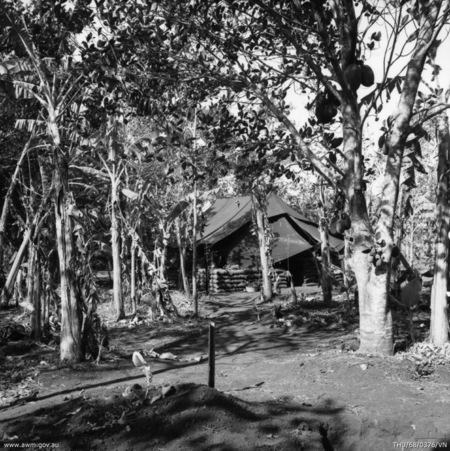 The following photograph illustrates what accommodation at Nui Dat was like, and my tent in Anti-Tank looked pretty much the same. Inside the tent, a camp bed for each man was standard issue, but most of our furnishings and creature comforts were improvised. Cupboards and tables could be made from ammunition containers, while fold-up chairs could be purchased in the town of Baria. Regular laundry trips into Baria were among Willie Gutjahr’s duties, and he would take orders from anybody who wanted to buy something for their tent. I mention my living conditions at Nui Dat because they will become significant later in this story. Operation Pinnaroo began in the final weeks of the dry season. As anybody who has lived in the tropics will be aware, this is the most uncomfortable time of the year. The heat and humidity are relentless, while each day there is a build-up of clouds, cruelly teasing with an empty promise of relief. 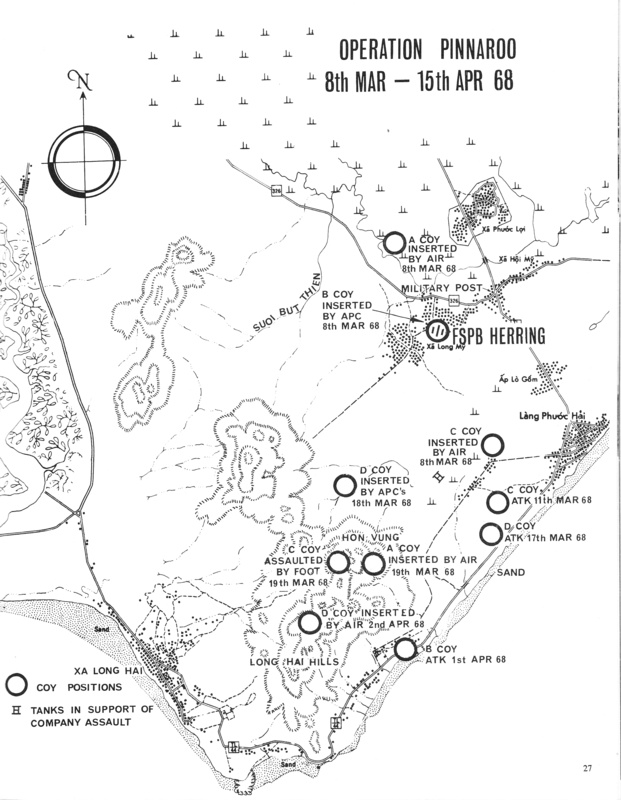 The operation would last nearly seven weeks, and Anti-Tank Platoon would spend most of that time camped on sand dunes, devoid of shade and exposed to heat, sandflies and mosquitos. We left Nui Dat and travelled on armoured personnel carriers. 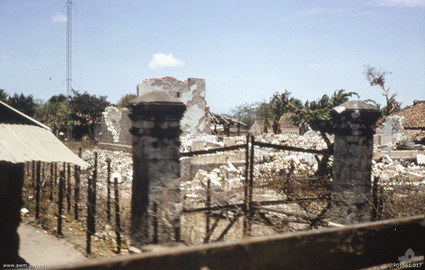 We drove through Long Dien, past the ruins of the market place that had been the scene of our earlier battle during Tet. We stopped for breakfast just outside the town of Dat Do, where one of the APC crew members took a picture of our dog-handler Garry (Polly) Polglase and his dog Julian. Readers of this story will recall that Polly and I had been hootchied up together at FSB Andersen, and as a result of that shared experience we had become close friends. I should add that Polly was the sort of person who had a lot of friends. In fact, I would suggest that if all Anti-Tank members had been asked to name their three closest friends in the platoon, most would have named Polly among their three choices. 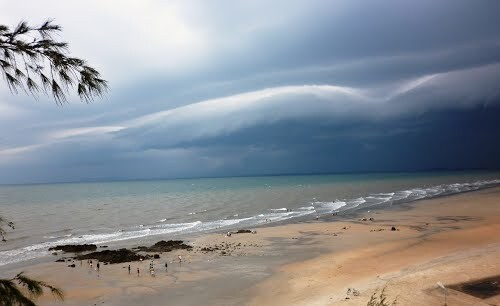 After breakfast in Dat Do, we headed off to the south, towards the fishing village of Lang Phuoc Hai. On this part of the trip I was sitting on top of an APC when it brushed past a tree, and a spider dropped down and bit me on the back of the neck. It was a plain-looking black spider of medium size. There are very few deadly species of spider in the world (two of them are Australian), so most spiders can’t kill a grown man. But they sure can give you a nasty bite. This was probably the worst bite I’d had from any creepy-crawly creature at this stage of my life, but that record would be broken more than once in the next few weeks. We set ourselves up on sand dunes just to the east of the Long Hais. We needed to be close to the mountainside, because we were going to use our anti-tank weapons to provide fire support for the battalion’s rifle companies in their activities in the coming weeks. While Anti-Tank travelled overland by APC, some of the battalion’s rifle companies flew to the Long Hais by helicopter. The following picture shows them taking off from Kangaroo Pad at Nui Dat. Prominent in the picture is one of my Signal Platoon colleagues, Doug Poole. On this operation we carried our main anti-tank weapons, the 106mm recoilless rifles. 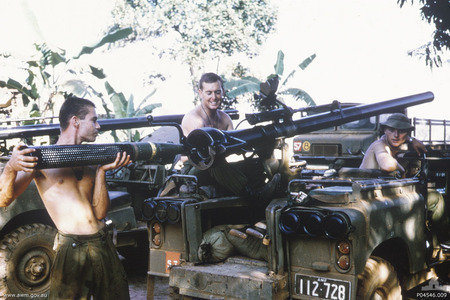 Although the local VC didn’t have tanks, these weapons had already shown themselves to have an effective anti-personnel application in Long Dien during Tet. The following picture shows members of Anti-Tank Platoon loading one of these vehicle-mounted weapons. The B52 bombardment of the Long Hais was supported by Australian and New Zealand artillery, but to add further interest to young diggers like me, we also had the opportunity to watch additional fire support from the US battleship New Jersey. We couldn’t see the ship itself, because it was firing from way out at sea, over the horizon. But its contribution to the fireworks display was pretty impressive. 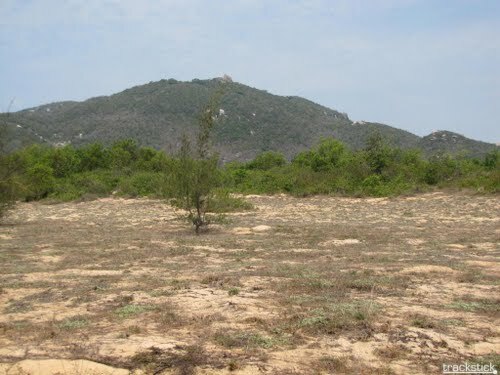 After the bombardment, Anti-Tank platoon took up a position in the sand dunes just to the east of the mountains, as part of a cordon in preparation for an assault on the summit of the Hon Vung feature, one of the highest of the Long Hai hills and a suspected VC headquarters. The other companies of 3RAR were all involved in the cordon. We settled into our dual roles: patrolling around the sand dunes and the foothills at the bottom of the Long Hais, and using our anti-tank weapons as fire support and as spotters for American air strikes. The map below shows that we occupied several different positions in the next seven weeks, and I will explain all of those moves later in this story. When writing a story about war, even a story based on personal memory, some things are impossible to describe. It is difficult to express to those who haven’t experienced it, how damned uncomfortable it can be. During the seven weeks of Operation Pinnaroo, I can honestly say there was never a moment when I felt comfortable. It was always hot. The days belonged to the sand flies, and the night belonged to the mosquitoes. We were stuck with the paradox that we couldn’t live without covering our exposed skin with insect repellant; while our professionalism as soldiers told us that the smell of insect repellant was one sure way that the VC could detect us. In addition to the sand flies and mosquitoes, I suffered two tick bites on this operation, while my adventures with other creepy crawlies will feature later in this story. The tick bites were quite nasty. Once the tick gets hold of you, it digs in for a day or two before you know it’s there. You just become aware of an itchy spot at first, and later it becomes more and more painful. But the first time it happens, it takes days before you realize what it is. My first tick bite was right at the bottom of my right ear, while the second was on the collar bone at the front of my neck. One day while we were on the sand dunes, I was watching a couple of light aircraft circling over the ocean near the headland at the foot of the Long Hais. They were observing and providing corrections for an artillery strike. While I was watching, I saw a wing fly off one of the aircraft, which then spiraled downwards and crashed into the water a short distance out from the beach. There was no parachute, so whoever was in the aircraft went down with it. We reported the crash, and a short time later Anti-Tank platoon was given the task of going down to the beach, finding the wreckage, and retrieving any bodies and documents. The mission was cancelled however, before it even started, because it was decided above battalion level that this was a job for the SAS. A couple of days later, we were spotting for an American air strike on the side of the mountain. If you look at the picture of the 106mm recoilless rifle further up this page, you will see that it has a second barrel attached to the main barrel. This smaller barrel fires 50 calibre tracer rounds, which help to get the weapon on target before it fires the main shell. On this day we had seen VC activity on the mountainside, and air strikes had been called. 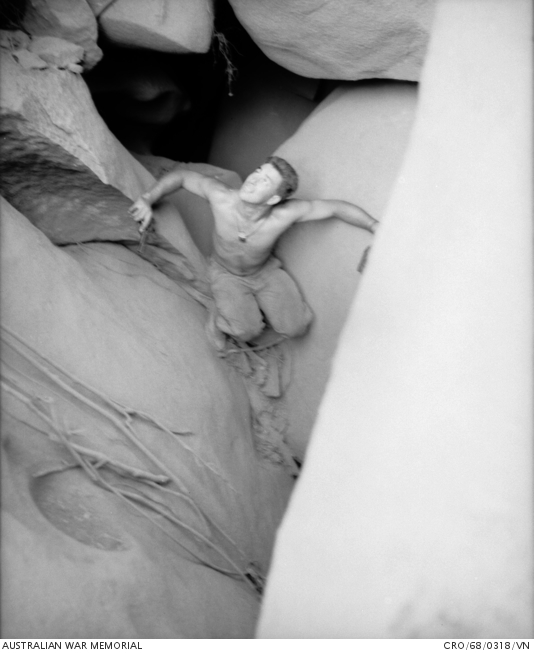 At one stage we saw some VC go into a cave. The American pilot asked us to fire tracers to show him where the cave was, so one of our 106RCL crews used the 50 cal to fire a tracer round. Now, bear in mind the fact that, from where we were, the cave looked like a pinprick in the side of a mountain. I couldn’t believe my eyes as the 50 cal tracer round went right into the cave opening. Those 106s were incredibly accurate. Later, as we watched the air strike, one of the American aircraft went into a dive to fire at a target, and didn’t pull out. Just before it hit the mountain, I saw two things fly off the aircraft. I presume they were the cockpit canopy and the pilot in his ejector seat. Unfortunately, they deployed too late and crashed into the mountain a fraction of a second after the aircraft. Within about three days, I had witnessed two fatal air crashes. Decades later, while I was working on a PhD at the Australian National University, I received an email from a fellow member of a Vietnam War scholars’ internet forum. He asked me if I knew anybody who had served in 3RAR and had witnessed the crash of a US aircraft in the Long Hais. His inquiry was on behalf of a member of the family of the pilot who had died in the crash. I was able to tell him that I had, in fact, witnessed the crash myself. The following picture is a recent photo from Google Earth, showing a view of the Long Hais from the sand dunes where Anti-Tank Platoon did its patrolling in the early weeks of Operation Pinnaroo. During our time in the sand dunes, we did a lot of patrolling. Most of our patrols were around the dunes and flatlands, but some took us up into the lower slopes of the Long Hais. By this time I had developed a very good working relationship with my platoon commander, and I particularly appreciated the way he encouraged me to exercise my map reading skills. Of all the military skills of an infantry soldier, map reading had always been my strongest. On these patrols around the Long Hais, whenever we stopped for a break, the platoon commander would work out our position and send a locstat (location statement) to BHQ over the radio. Often, before sending the locstat, he would ask me to check our position and work out a locstat myself, which he would then check against his own. While we were on the move, he would occasionally point to a natural feature and ask if I could locate it on the map. These are the kind of small encouragements that can make a big difference to a young soldier’s self-confidence. The picture below shows Anti-Tank Platoon Commander Colin Clarke and me taking a break while out on patrol. One night while we were in the sand dunes, we heard the sound of a fire fight coming from the B Company position, a short distance away from us. I was sitting with my platoon commander when the contact broke out, and stray bullets from this contact came zipping past our ears at an uncomfortably close distance. We both dived for cover, only to discover that we had dived into the pit in which the ammunition for the 106mm RCLs was stored. We scrambled our way out of there to look for a better place to take cover and as I grabbed at the wall of sandbags to pull myself out, my right hand slipped into the gap between two sandbags and I felt a sudden sting at the tip of my little finger. I was in too much of a hurry to stop and find out what had stung me, but as I jumped over the sandbags, in the fairly weak light of a flare fired over in the B Company position, I could see that it was a small scorpion. The rest of that night I was in absolute agony. Meanwhile, we had to be on guard, because there was a good chance that the skirmish at B Company might give us an ambush opportunity. Any VC who managed to escape the contact might well head in our direction. I spent a sleepless night, and felt pretty sick the next day. Fortunately however, the pain and swelling didn’t spread very far up my arm. This was undoubtedly the worst sting I had ever experienced. Little did I know that that record would last only a couple of weeks. In the day-to-day routine of life among the sand dunes, one of the few highlights would be the arrival of supplementary ration packs, delivered by resupply chopper once or twice a week. For our daily food needs we used American C-rations. Each C-ration pack contained one meal, unlike the Australian ration packs we had become accustomed to in our training back in Australia. Each Australian ration pack was only slightly bigger than a C-ration pack, but provided a full day’s food. Because of this comparison, while American soldiers would complain about having to eat C-rats, I thought they seemed positively luxurious. Each C-rat pack contained a canned meal, a canned dessert, sachets of coffee, powdered cream, sugar and salt, a combined can opener and spoon (such a handy little device that a lot of veterans took them home as souvenirs, and still use them today), plus cigarettes, matches, and chewing gum. The supplementary ration packs would contain more cigarettes, chewing gum and a variety of American confectionary, plus toothpaste, shaving cream, envelopes, writing paper, and other creature comforts. For a non-smoker like myself, the supplementary packs provided even more trading options than the C-rats. I was never in any danger of running out of Chiclets or Hershey bars. We also received supplementary supplies of fruit juice. It arrived in very large cans, which were then doled out to the platoon so that everybody got their fair share. Unfortunately, these juice deliveries only served to highlight problems in the supply chain. Whatever variety of fruit juices departed from the point of origin, it seemed that only the less palatable, such as grapefruit juice, would reach us. The more desirable varieties were being picked off along the way. There is a silver lining to this however, because through those juice deliveries I developed a taste for grapefruit, which is still a part of my preferred breakfast today. Anti-Tank Platoon never made it to the top of the Long Hais. C Company carried out an assault on the summit while we were in our cordon position in the sand dunes. 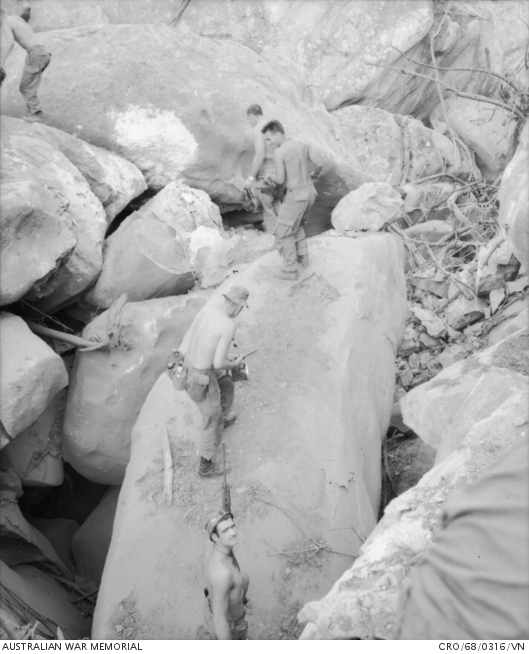 They were joined by A Company, Assault Pioneer Platoon, and an Engineer unit to search what had been a local Viet Cong stronghold, known as the Minh Damh Secret Zone. So, even though I wasn't there, no account of this operation would be complete without some pictures of the work that was going on at the top of the mountain. 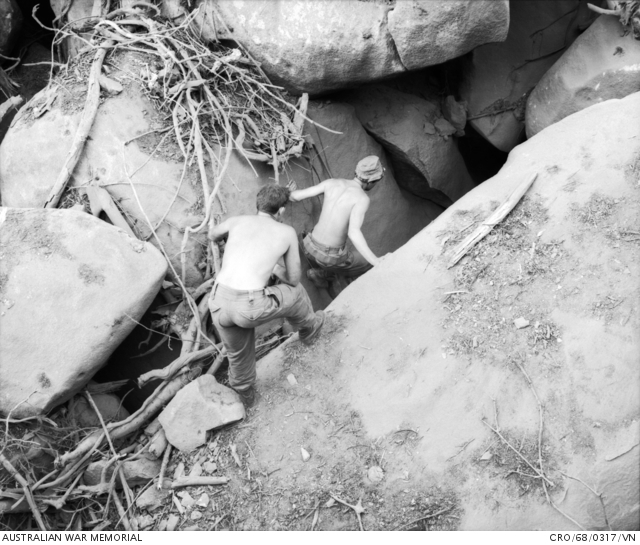 The following pictures are of 3RAR personnel searching tunnel entrances. While we were on Operation Pinnaroo, the Australian Task Force saw the arrival in Vietnam of some Australian Centurion tanks. They came down to the sand hills and flatlands of the Long Hais so that the tank crews and infantry soldiers of 3RAR could learn to work with each other. 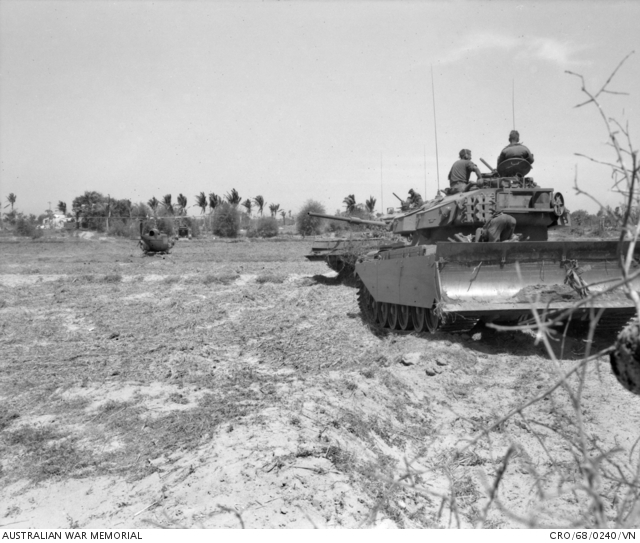 The following picture shows tanks working with 3RAR on Pinnaroo. For a short time Anti-Tank Platoon was attached to B Company while they worked with the tanks. 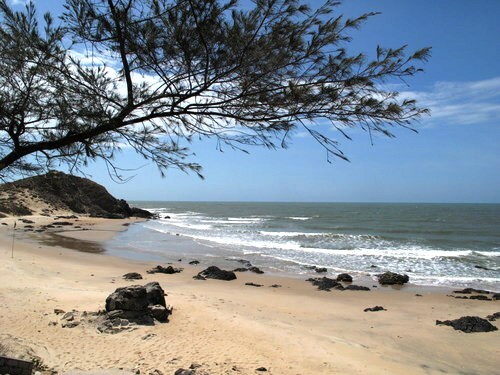 We moved from the sand dunes to the narrow strip of land between the foot of the Long Hais and the ocean. Later B Company moved to a new location, and we remained down by the beach. 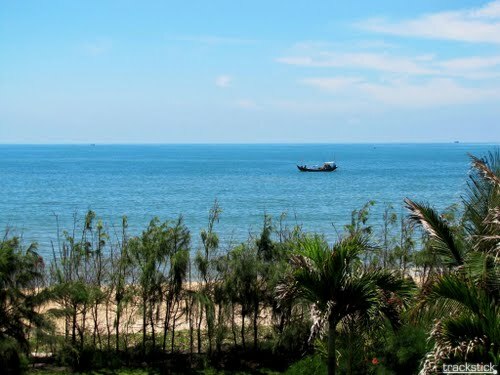 A narrow strip of coast separates the Long Hai hills from the South China Sea. On this coastal strip the grandeur that once was the French Empire lay in ruins in 1968. What must have once been magnificent seaside homes could still be recognised by their multi-coloured tiled floors and the remains of white-washed walls. The beach that once would have been the playground of the wealthy colonizers would stand comparison with those back home in Australia. The ruins provided a temporary base for my platoon while we conducted our patrolling activities into the hills. The following picture from Google Earth shows the view today from that very spot. It is now a beach resort. Previously our patrols had been carried out in the low scrubby bush of the sand dunes, but now we were going up the mountainside every day. Above us C Company, working with Engineers and the Assault Pioneer Platoon, were clearing mines at the top of the mountain. They suffered heavy casualties. Every explosion was a reminder to us that we could, at any time, be in a minefield. The only way we could know is if one of us stepped on a mine. Try to imagine going for a walk knowing that each time you put your foot down you could be blown to smithereens. This is scary work. At night we would go up the mountainside and set up ambushes. On one of these all-night ambushes I was lying in my ambush position when something stung me on the chest, right above my heart. This was the worst bite or sting I had ever experienced. My first instinct was to scream but I couldn’t, because I was in an ambush position and silence was essential. I grabbed my bayonet and stabbed at the ground where this thing, whatever it was, came from. Then, because I had made a noise with my frenzied stabbing, I had compromised my position and had to crawl away and take up a new one. The pain in my chest was just about driving me crazy, but I just had to bite my lip because I was there for the whole night and I couldn’t make a sound. There is no doubt in my mind that the creature that bit me was a giant centipede. These things were a constant worry for us, because they are burrowing creatures, and we were spending a lot of our time below ground level. There was always a danger that a giant centipede could burrow its way into your pit while you were asleep. In the last days of Operation Pinnaroo, our platoon was given an unusual mission. We were to go out on a night patrol, around the coast, past the Long Hais, and beyond the battalion’s area of operations. We would find a place to hide ourselves from sight for the whole of the next day, and then, when we were sure we had not been seen, we were to move into an all-night ambush position in the sand dunes that covered a particular beach. In our orders it was emphasized that absolute secrecy was essential. The beach was believed to be a Viet Cong supply route, and there was a very strong chance that someone would walk into our ambush. The site was designated a free-fire zone, so anybody walking on that beach at night was assumed to be the enemy and could be shot on sight. As soon as it was dark enough we moved out. Moving at night was more than a little unnerving. The common perception of this war was that we moved by day and our enemy moved by night. 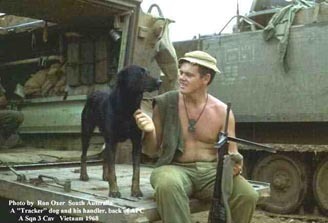 No doubt somewhere out there a Viet Cong soldier was on a patrol just like this one, feeling that the night was his friend. To me it felt like the enemy. But I trusted all the blokes who were walking ahead of me, and I just kept going, trying to be as quiet as possible. Some time before dawn we reached the ruined villa that was our destination, and settled in. The next day was one of the longest I have ever spent. We could not speak, move from our positions, or light fires. So we ate cold C-rations for breakfast, lunch and dinner and drank only water or the powdered cordial that comes in the ration packs. And we waited. When night fell at last, we moved out. We found a suitable ambush site on the sand dunes overlooking the beach. We took up our positions and waited. I can’t remember how long we waited, but eventually two shadows with human form walked right into our ambush. They were not walking on the sand, but about ankle-deep in the water. I lifted my rifle to my shoulder, took aim, and switched the catch from "safe" to "automatic." My first thought was that I had been lying in sand for hours. It would be just my luck to be caught in a fire-fight with a barrel full of sand and a rifle that wouldn't fire. The two figures were getting closer. I knew I couldn’t be the first to fire. I had to wait for a claymore mine to be triggered and our machine gunners to open fire. No matter how much you expect it, the first shot always comes as a shock. When the claymore exploded I felt like I had jumped six feet into the air and landed back in my firing position. Then my finger squeezed the trigger and the nerves disappeared. The whole platoon opened up in unison, M60s, SLRs and M16s. Both figures fell. The ambush broke off as suddenly as it had started. If you want to know the definition of the word "vulnerable," just consider the silence that follows a short, sharp contact at night, when your platoon is sitting on a beach, miles from the rest of the battalion. Were our two victims alone? Will their mates come looking for them? Are they forming up right now to attack us? Is there a mortar platoon out there somewhere locking on to our position and preparing to fire? There was nothing we could do except maintain our position and wait until first light. Then we could go out and check the bodies. This was standard operating procedure for ambush patrols. So we stayed where we were, and we waited. While we were lying there waiting for dawn, we heard the unmistakable sound of artillery shells passing over our heads. Then we heard and felt heavy objects thudding into the sand all around our position. It seemed as if somebody was shooting at us but their shells were not exploding. I was supposed to be maintaining radio silence, but my platoon commander decided that we had to break our silence to find out what was going on. It seemed to take forever, but eventually we were told that a South Korean artillery unit had been firing parachute flares, and after the shells had exploded in the air and released the flares, the empty shell casings had fallen to ground almost right on top of us. Because of the secrecy of our mission, the Koreans didn’t know we were there. When dawn finally came the first rays of sunlight revealed one body at the high water mark on the beach. The waves had been washing over it during the night, until the tide had turned and left it on firm sand. There was no sign of the other body. My first thought was that it must have been washed out to sea. We examined the body. It was a man, probably about 50 years old. He had a lot of bullet wounds, but the one that stood out for me was an M16 tracer round sticking out from his thigh. A tracer round has a lesser charge than a normal bullet, so it doesn’t have the same penetrating power. This particular round had barely broken through his skin. I always loaded my M16 magazines with at least three tracer rounds: one to help me to get on target, one in the middle to help me stay on target, and one near the end to let me know I would soon need to reload. Every member of the platoon had fired at this man, but we could not be sure which of us had hit him. Except that I now knew that someone who used M16 tracer rounds had definitely hit him. And I used M16 tracer rounds. On further examination it became apparent that not only was there no second body, but there was no sign of a weapon. All we found was a basket containing nothing but food. After any contact it was my job to send a coded contact report by radio. While I was preparing the report, one of my mates came over and asked if he could borrow my bayonet. I gave it to him without further thought. Carrying a bayonet was optional, but I always carried one because I found it a useful tool with a variety of uses. The person who wanted to borrow it on this morning was a forward scout who carried an M16, like me, but preferred not to carry a bayonet. I went back to preparing the report, until I heard some laughter behind me, and when I looked around I saw my friend posing for photographs, standing over the body and appearing to be jabbing it with my bayonet on his rifle. The person I am talking about was the best forward scout I have ever worked with, and I doubt that there was a better one in the whole Australian army. He also was then, and is still today, a good person. If what I have just described does not seem to my readers to be the actions of a good person, then I can only say that the reader has not been through what we had just been through. It had been just ten weeks since the start of the Tet Offensive, and in that time we had experienced the battles at Baria and Long Dien, the repeated mortar, rocket and ground assaults on our position at FSB Andersen, the wounding of one of our dog handlers, Phil Moore, on a tracking mission out of Andersen, and now this relentlessly harrowing operation in and around the Long Hai Hills. If there is a judgment to be made, then it should be a judgment on war, and not on any individual trying to do his best in extreme circumstances. While my platoon commander was working with me on the contact report, members of the platoon came to him with a proposition. They had vivid memories of FSB Andersen, where we had fired thousands of rounds at our attackers, only to find that the bodies had been dragged away by the time clearing patrols had been able to go out in the morning. That led some of our more unkind colleagues to give us the nickname “shadow shooters.” Now the members of my platoon were concerned at what would happen if I were to send a report that said we had killed an unarmed man. Their proposal was that we put some grenades in the dead man’s basket to make it look as though he had been carrying weapons to someone up in the hills. I was against the idea, but I knew my arguments would carry no weight against the overwhelming majority. The platoon commander was also against the idea, but decided that it would not be fair for this platoon of truly exceptional soldiers to be subjected to further derision of the “shadow shooters” kind. So he went along with the idea. I had no choice but to send a falsified contact report. Given that I was just 20 years old and quite immature for my age, you might well think that the significance of what I was doing might have been lost on me. But that would be wrong. I knew at the time that this incident was the greatest moral test I had faced in my young life, and that I was failing that test. Even though I know I could have done nothing to change what happened, that failure of moral courage still haunts me today. We had some top class visual trackers in our platoon, and it wasn’t long before they found a blood trail on the beach, leading off in the direction from which our victims had come. So our second body had not been washed out to sea after all. We set out to follow the trail in the direction of the village of Xa Long Hai. This, of course, meant that we were moving even further away from the rest of our battalion, and from any support we might need if anything serious should happen. After a while we saw in the far distance a crowd of people heading towards us. It was a very big crowd indeed, and if it was hostile, we were in a lot of trouble. It was unlikely that an enemy unit would be moving on an open beach in broad daylight, so we set up a defensive position and waited for them to reach us. When they did reach us, it was apparent that it was a crowd of Vietnamese civilians, and fortunately for us they had an American military adviser with them. He told us that a critically wounded woman had crawled into the village in the early hours of the morning, and the whole village had turned out to look for her husband. So, not only had we killed an unarmed man, we had critically, probably fatally, wounded his wife. An animated discussion followed, in which our platoon commander asked through the American adviser if there was any possibility that this unfortunate couple could be VC sympathizers who might carry supplies up into the hills at night. The village head man reluctantly agreed that this possibility could not be ruled out, the crowd headed back to their village, and we started making our way back to the position we had left two days earlier to embark on our night patrol. Here is a Google Earth picture of the beach where our ambush took place, as it looks now. The rocks you can see on the left are the ones right at the bottom of the map of the Long Hais that you saw previously in this chapter. Our ambush position was a little to the right of this picture. Here is another Google Earth picture, showing the view to the right of the previous picture. This is where we followed the blood trail and were met by the crowd of people from the town of Long Hai. Although I lacked the intellectual capacity to articulate it at the time, I felt that somehow everything about this patrol had been wrong. In this war we obviously believed we were the good guys. Generally speaking, we owned the day, and our enemies liked to believe they owned the night. So we had a set of dichotomies: Day/Night; Light/Dark; Good/Bad; Us/Them. By setting out on this long night patrol, it seemed that we had turned those assumptions upside down. A day or two after we returned to our temporary base in the French ruins at the base of the Long Hais, my mate Garry “Polly” Polglase, a dog handler in the tracker team, came to the platoon commander and said that his dog, Julian, was unwell, and that he needed to go back to Nui Dat to give him the proper care. I tried to talk him out of it. Operation Pinnaroo was almost over. We had come through so much, and in just a few days we would all be going back together. But Polly was adamant, and no argument could change his mind. That afternoon Polly and Julian boarded a resupply helicopter to fly back home to our base camp at Nui Dat. In my mind I can still vividly see the huge grin on his face as the chopper took off. He was clearly pleased that, at least for him, Operation Pinnaroo was over. The message was received with disbelief. Polly had escaped the extreme danger of the Long Hai Hills and returned to the relative safety of our base camp. How could he possibly be dead? Our platoon commander went on to explain that, although he had no details, he had been informed that Polly and Willy Gutjahr had been the only people present when the incident occurred, and that Willie Gutjahr had apparently been in possession of an unauthorized pistol, purchased on the black market in Baria. The mood turned from disbelief to anger, and several platoon members said “I’ll kill him!” But the platoon commander calmed things down and reminded us that we had to finish this operation, and when we returned to Nui Dat an inquiry would be held, and we would find out what had really happened. I had no idea how to react to this news. Polly and I had become close friends at FSB Andersen, and the friendship had become even closer on this operation. I was stunned and speechless. Nothing I had experienced in my life up to this point had prepared me to deal with this. The other members of the platoon had known Polly longer that I had, and somehow they seemed able to get on with their work with a look of steely determination on their faces. I decided that I simply had to do the same. That night was our last on Operation Pinnaroo, and we returned to Nui Dat the next day. I found that my tent had been surrounded with tape, and I was allowed to go in for only as long as it would take to pack my things and move out. At that moment it dawned on me that Polly must have been killed in my tent. That would make sense, given that I shared that tent with Willy Gutjahr, but somehow it hadn’t occurred to me before. I sat down on my bed and started to pack my gear. There was a dark stain on the floor right next to my bed, and a smell of pine disinfectant. In the ammunition container that I used as a rubbish bin I found a Polaroid negative. That is the piece that is peeled off and discarded when a photograph is taken with a Polaroid camera. Although it was in negative, I could see the outline of a body, and the picture had clearly been taken right where I was sitting. A picture was starting to emerge. Not only was Polly killed in my tent, he was most likely sitting on my bed, chatting with Willy Gutjahr when he was shot and fell to the floor. From that day to this, I have always tried to avoid pine disinfectant, because to me it is the smell of death. Even today, just around the corner in the quiet suburban street where I live, there is a pine tree which, at certain times of the year, gives off that same smell. Every time that smell hits my nostrils I am immediately taken back to that day and that tent at Nui Dat. That tree is between my home and the local shops and my son’s school, so I pass it every day. You would think by now that I would be ready for the smell, but somehow it always takes me by surprise and I relive the experience once again. After Operation Pinnaroo I was transferred out of Anti-Tank Platoon into a new job in a different sub-unit of the battalion. That will be the subject of the next chapter. Willy Gutjahr was transferred out of the battalion and I never saw him again. A few years ago I saw his name in a veterans’ magazine, on a list of veterans who had recently died. One of the members of Anti-Tank Platoon, Wal Barnett, volunteered to take Polly’s place as Julian’s handler. This was an extraordinarily brave thing to do. He had no previous training as a dog handler, and he would have to start from scratch, teaching Julian how to respond to a new master. Wal did the job extremely well, and I have always had the utmost respect for him for taking it on. 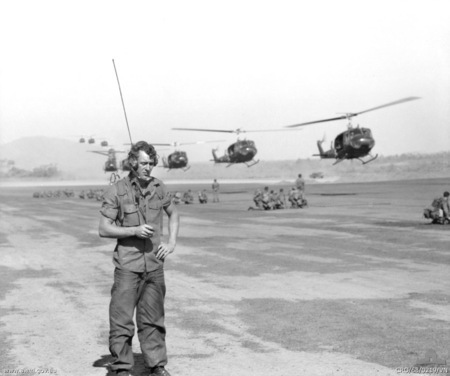 In 1987 I spoke to a counselor at the Vietnam Veterans Counselling Service in Perth, Western Australia, about the events of Operation Pinnaroo, and particularly about the circumstances of Polly’s death. As a result of that counselling session I wrote a poem, “He Was A Mate.” That poem has developed a life of its own. It is now being studied by students all over the world, and is often used at Anzac Day, Vietnam Veterans Day, and other commemorative services. That poem will undoubtedly be the lasting legacy that I will leave behind when my life is over.